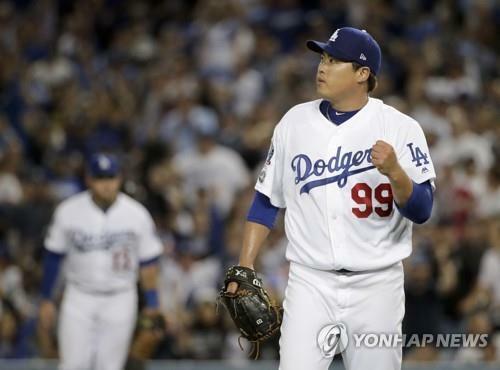 SEOUL, Oct. 29 (Yonhap) — Los Angeles Dodgers’ South Korean pitcher Ryu Hyun-jin has seen his up-and-down season end with a loss to the Boston Red Sox in the World Series, his future beyond this year still uncertain. Ryu was left off the Dodgers’ postseason roster in 2017 as they made it to the World Series and lost to the Houston Astros in seven games. But this year, Ryu was the surprise Game 1 starter over staff ace Clayton Kershaw in the National League Division Series (NLDS) against the Atlanta Braves. The South Korean made manager Dave Roberts look prescient, as he tossed seven shutout innings and struck out eight in the Dodgers’ 6-0 victory. He started Game 2 and Game 6 of the NL Championship Series (NLCS) against the Milwaukee Brewers — both on the road — and gave up seven earned runs in 7 1/3 innings combined. A former MVP-winning All-Star in the Korea Baseball Organization (KBO), Ryu signed a six-year, US$36 million deal with the Dodgers in late 2012. He became the first South Korean to jump from the KBO to the big leagues.